Snow White Discovers the Cottage and other artwork by artist Thomas Kinkade can be viewed in our artist slideshow. 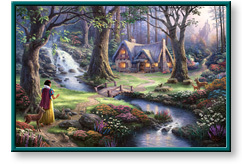 Snow White Discovers the Cottage by artist Thomas Kinkade and other Thomas Kincade art, art work, artwork, canvases, giclees, images, limited editions, open editions, paintings, paper, pictures, posters, and prints can all be found at Christ-Centered Art. "As a child my imagination was stirred by the great animated films of Walt Disney. Imagine my delight when Disney recently opened their archives to me as I prepared for my first-ever series of images inspired by classic Disney moments. "In the first piece of my Disney Dreams Collection, Snow White's world is alive with color. The Prince's castle where Snow White will eventually discover happiness looms majestically in the distance, while a foaming waterfall and fanciful animals remind us that Snow White is at peace with all of nature. Of course, I also included my iconic colorful flowers which festoon the scene with hopeful reminders of spring. "I hope that Snow White Discovers the Cottage will be a fairy tale come true for Disney and Kinkade collectors everywhere." Snow White Discovers the Cottage by artist Thomas Kinkade as well as other open and limited edition inspirational paper art prints and canvases, giclees, images, lithographs, paintings, pictures, posters, and reproductions by renowned Lightpost Publishing, Media Arts, and The Thomas Kinkade Company artist Thomas Kincade can be viewed and purchased at special sale prices at Christ-Centered Art.